Yesterday, approximately 650 students across four Carroll campuses walked out of class at 10 a.m. in order to memorialize the 17 victims of the shooting at Marjory Stoneman Douglas High School and to raise awareness for the need for safety in schools. 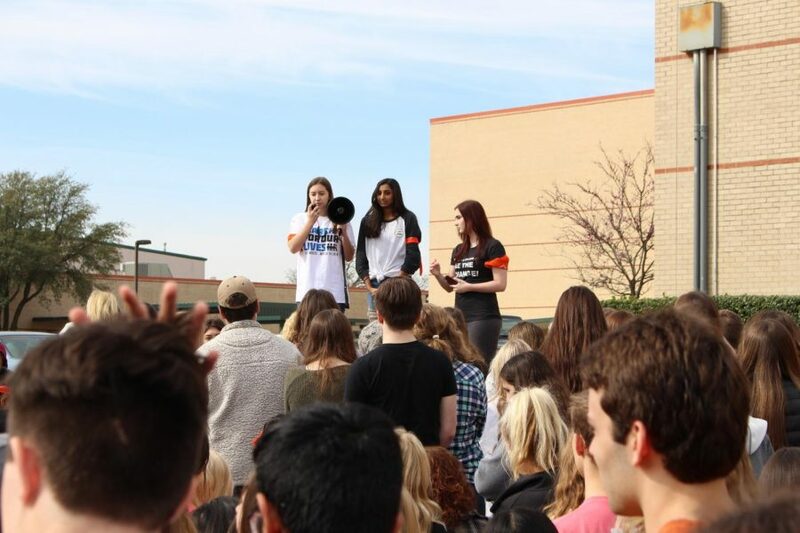 Two juniors, Anika Shah and Alanna Miller, worked with the school administrators and the school board to organize a safe and successful event. Miller also believes that school shootings affect students more than parents and administrators realize. Some members of the choir participated and sang “The Lord Bless You and Keep You” to honor the 17 lives lost. “I believe that having the choir there and singing this beautiful song brought about an air of peace and calm and subdued any potential conflict, disillusionment or misunderstanding that may have come about from people at the event,” senior and choir member Emmy Pratt said. An important part of the school safety conversation, according to one senior, is learning how to listen to both sides, especially as we do not know all the answers. The senior high administration was supportive of the students who chose to walk out, and while the district didn’t sponsor the event, they took precautions to ensure that students who did choose to walk out would be safe. Like the administration, many teachers were supportive of students’ rights to exercise their constitutional rights. AP/GT and on-level English III teacher Sarah Thomas had a similar opinion. Among parents in the community, the responses were mixed. Many took to social media to express their concerns with the event. Other parents commended students on their courage and willingness to stand up for what they believe in. While many students were excited to exercise their First Amendment rights, others disagreed slightly with the message and the way that it may have been delivered. While the event did create some differing opinions, the organizers are happy with the end results and how much media attention from CBS Dallas, The Dallas Morning News, and The Fort Worth Star-Telegram they were able to garner.